The Animal Quest Globe and Game is a homeschool favorite! Travel around the world and discover species of animals that thrive in each region. Answer the questions correctly and you can race around the world to find where the animal resides. Game can be adapted for any level of learning. A must for geography and zoology learning! 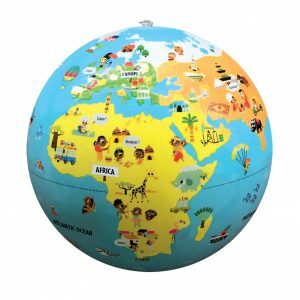 – Globe is printed from the inside to create a durable, glossy globe. – Includes 54 playing cards with multiple choice questions, 4 Caly sticks to use as markers on the globe and game instructions.